I love receiving gifts. I love the unwrapping and the excitement of having something shiny and new. I also love the fact that people care enough to choose something for me. It doesn’t matter if the gifts are big or small … it really is the thought that counts for me. I love giving gifts. I’ll admit that do I worry about the gifts I give. I wonder whether they’ll be suitable and appreciated but when I manage to choose the right gift, it’s a beautiful thing. With Christmas just around the corner I know that there’ll be a fair bit of giving and receiving in the coming weeks. While many gifts are fun, there are some that are absolutely life changing. Funds raised from the Gifts of Compassion catalogue are used to support Compassion’s Critical Needs, which remove obstacles to children’s development and implement preventative action. These interventions include providing safe water, disaster relief, emergency medical care, vocational training, infrastructure, and much more: all issues that need to be addressed for a child to be released from poverty. It concerns me that while I’m enjoying lovely new things that I don’t really need, there are people in many parts of the world that don’t have the basics that they need to get on with the daily task of just keeping their families alive. If Christmas is about celebrating Jesus, surely we should be doing something that honours him and his desire that we care for the poor, rather than overindulging while most of the world goes without. Don’t get me wrong. I’m not suggesting we should all be miserable and not fully enter into the celebrations at this time of year. I suppose that’s where we all need some kind of balance between the giving and receiving of gifts between friends and loved ones and our wider responsibility to those in need around the world. We live in a global village but most of the villagers are missing out. Those of us who’ve been blessed by simply being born in the right place should spare a thought for those who only ask for the gift of life this Christmas. 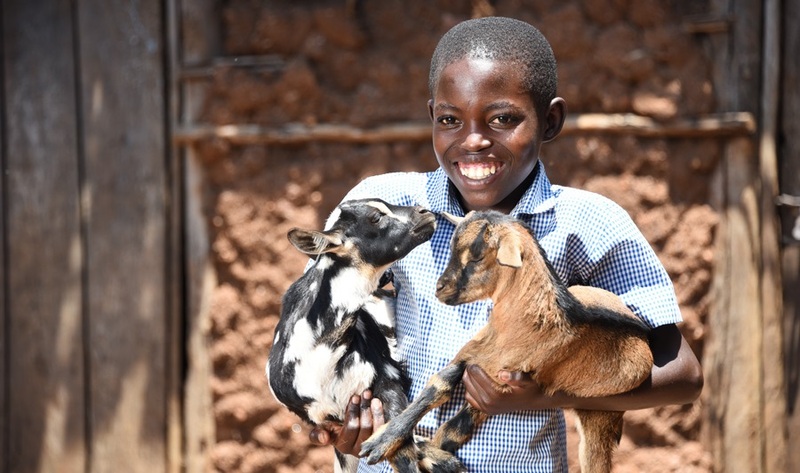 I might not have a lot of use for a goat but for a rural family in a developing country the simple gift of a goat could be just what they need to be released from poverty. So where do you buy a goat and how do you get it to someone who needs it? Compassion Australia’s Gifts of Compassion is open and ready for business. That’s where you can buy gifts that help people who are battling desperate poverty. They can take your money and turn it into a very real solution to poverty. You can buy everything from a chicken to mosquito nets and lots more in between including goats, cows, tooth brushes, sewing machines and baby vaccinations. Your support really does make a difference. I’ve visited churches partnering with Compassion in seven of the 25 countries where Compassion is working and I can personally vouch for the fact that it makes a difference. When you support those in poverty through Compassion, the aid really does make it to those who need it. In fact, it was after seeing the work of Compassion that I decided that I would do all I could to advance their work which is why I’ve now been working full-time for Compassion for just over four years. This Christmas I do want to receive something for myself, wrapped in thought and love, but I also hope that someone will give me a goat or a chicken or some clean water for someone I’ll never meet. Go on … you’ve thought about it before but unless you let your loved ones know now it’ll never happen. Ask those you love to buy something for someone else this Christmas.